Which 2018 Chevrolet Camaro Is For You? With a variety of engines, it can be hard to choose between them, but we’re breaking down each trim to find out what Chevrolet gave us this year. Each of these options is available as a coupe or convertible, but we’re listing the pricing of the coupe for this article's purposes. 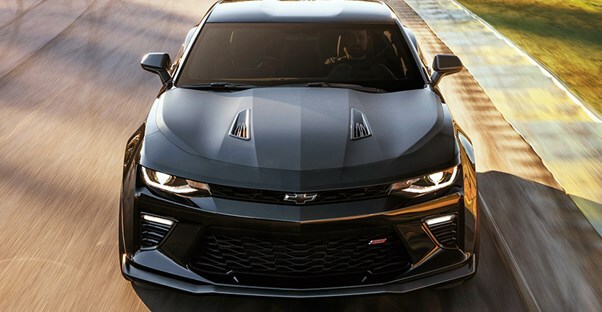 The Chevrolet Camaro 1SS looks more rugged to accompany the powerful engine under its hood. The price of the 1SS jumps to $37,995. That's because it has a 6.2-liter V8 DI engine that’s capable of a whopping 455 horsepower and 455 lb-ft of torque. Other mechanical changes include the addition of a limited-slip rear differential, rear differential cooler, and rear axle with a 3.73 ratio. The cooling system for the 1SS includes an extra-capacity cooling system, auxiliary engine coolant, and external engine cooler. On the inside, the Chevrolet Camaro ZL1 also comes with all of the luxurious features found in the 2SS, including heated and ventilated seating, a Bose premium audio system, and more. However, one standout is the inclusion of RECARO performance front bucket seats that feature a design specifically for high g-cornering. The steering wheel is covered in suede microfiber and features a flat bottom to increase legroom.